Anzhi Makhachkala has agreed a transfer fee with Inter Milan for Cameroon striker Samuel Eto'o, the Russian Premier League club said on Tuesday. Anzhi did not disclose the fee but media reports said it was about 30 million euros ($43 million), adding the four-times African Footballer of the Year could become the richest player in the world on an annual salary of 20 million euros. "The transfer sum has been agreed," said the wealthy team from the volatile North Caucasus region which is bankrolled by Russian billionaire Suleiman Kerimov. "Tomorrow the player will undergo a medical and if he passes it he will sign a three-year contract," the club said on its website (www.fc-anji.ru). 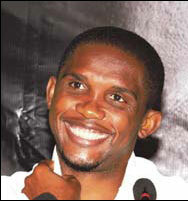 Eto'o, 30, won two Champions League titles with Barcelona before joining Inter in 2009. He won a Serie A, Italian Cup and Champions League treble in his first season in Italy. Anzhi, which also boasts Brazilian left-back Roberto Carlos and former Chelsea midfielder Yuri Zhirkov, said Eto'o could make his league debut this weekend. Four Premier League clubs, including all three newly-promoted sides, were knocked out of the English League Cup in the second round on Tuesday. Norwich was thrashed 4-0 at home by League One leader MK Dons and QPR also lost at home to opponent from English soccer's third tier, going down 2-0 to Rochdale at Loftus Road. And there was no joy for Swansea either following a 3-1 defeat away to League Two outfit Shrewsbury. Meanwhile, established top-flight side Sunderland saw its dreams of League Cup glory end with a 1-0 extra-time loss away to Championship highflyer Brighton. Norwich manager Paul Lambert, showing what he thought of the League Cup, changed all 11 of his starting line-up and his Canaries were 2-0 down at halftime following goals from former Norwich player Luke Chadwick and Sam Baldock. Rochdale gave QPR an early warning as Jean-Louis Akpa Akpro scored from a rebound after five minutes and Gary Jones made it 2-0 with nine minutes left thanks to a superb shot into the top left-hand corner. The kidnappers who abducted Chelsea midfielder John Obi Mikel's father in Nigeria demanded a ransom of $4 billion, the local police commissioner said on Tuesday. Michael Obi was released by his abductors on Monday and police said two Nigerian military officers were part of the group who took him on Aug 12. "(The kidnappers) asked him to give them $4 billion which they called chicken change to Mikel Obi and his club Chelsea," police state commissioner Emmanuel Dipe Ayeni said in Jos, capital of central Nigeria's Plateau state. He did not say whether any ransom was paid. Mikel earns $5.8 million a year and is the seventh highest-paid African footballer in Europe, according to Forbes magazine. The Nigeria midfielder played for Chelsea in a 0-0 Premier League draw at Stoke City the day after learning of the kidnapping and made public appeals for his dad's safe return. His management company said at the time a "sizeable" ransom had been demanded. It was not the first time a relative of a Premier League player has been abducted in Nigeria, where most people live on less than $2 a day, after former Everton defender Joseph Yobo's brother was kidnapped in 2008. Tipped as the next Didier Drogba, Chelsea new boy Romelu Lukaku is flattered to be compared to the powerhouse striker with whom he bears a striking resemblance in stature and playing style. Drafted into Chelsea's burgeoning squad from Belgian club Anderlecht this month for a fee media reports said was in the region of 18 million pounds ($29.68 million), the 18-year-old is now learning all he can from Drogba. With his hulk-like frame and swift turn of pace, the young Belgian has invited obvious comparisons with a player many pundits said he had been brought in to replace. 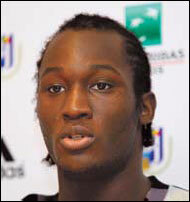 But Lukaku is now taking tips from the twice African Footballer of the Year Drogba. "To be compared with Didier is a very big honor to me," Lukaku said on Tuesday as he was introduced along with fellow close-season recruit Oriol Romeu. "Every time I spend time with him we talk and I sit next to him in the dressingroom. I listen all the time because he gives advice and, also with Nico (Nicolas Anelka) and Fernando (Torres) it is the same, so I am very happy to have world-class strikers around me."